The Children’s Health Insurance Program (CHIP) provides affordable, age-appropriate medical and dental coverage to more than 8 million children. Unfortunately, CHIP’s future is up in the air -- federal funding could expire on September 30, 2015. Unless Congress acts, families who rely on CHIP will lose access to this comprehensive, affordable health coverage. That's especially bad for children's oral health. To learn more, see this blog post or our detailed issue brief explaining why CHIP is so critical to dental and deserves continued funding. Talking Points that explain the need to extend CHIP funding through 2019. As of February 2015, 41 governors have written Congress in support of CHIP funding -- that's a bipartisan success. A Template Letter you can share. 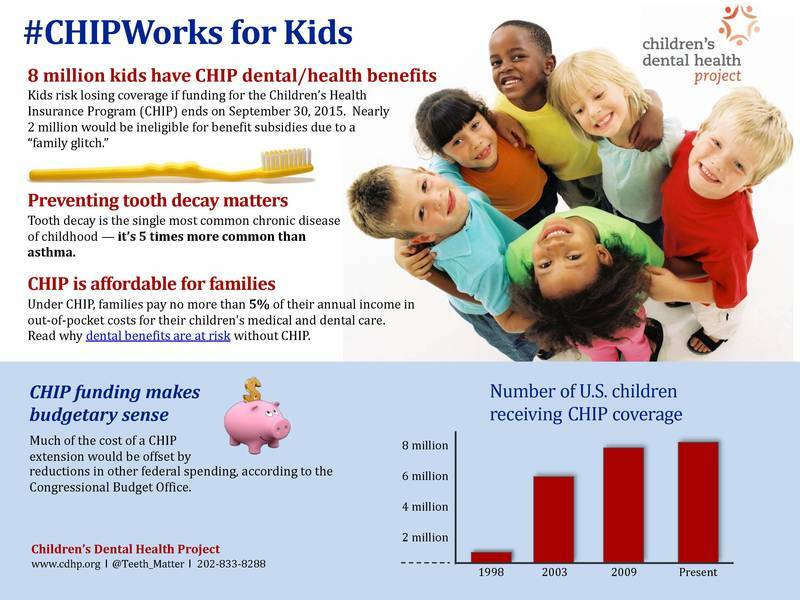 This Infographic with key facts demonstrating why CHIP plays such a key role in children's oral health. Meg Booth, CDHP's policy director, co-wrote this newspaper column with a health policy analyst for Voices for Utah Children. The column urges Congress to extend CHIP funding through 2019.